I read these while putting together the 'Talk Like A Pirate' post. Despite being published in the 1880s, Treasure Island remains an exciting read. 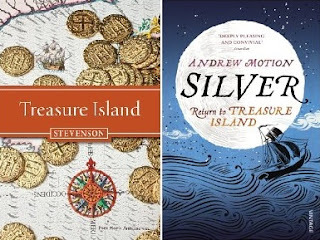 Andrew Motion has written a worthy sequel - the first half is impressive with the kind of suspense, imagery and mastery of language you would expect from a Poet Laureate, but the story gets a bit tangled up in itself during the second half.